You are powerful beyond measure. This is one of the central messages of The Magician in Tarot. Desire is not enough. Desire combined with will and intention - that's dynamite! Desire is a fuel - this is something I'm often keen to tell my clients, particularly when they are looking to make strides in their businesses, studies or spiritual practices. Desire, when funneled into the vehicle of pure will, can take you all the way over the rainbow. Respecting your desire and appreciating its inherent worth is vital. When desire is left unused, frustration follows.. When The Magician turns up in your readings and Tarot musings, ask yourself how well you are directing your desire. How much light and space does it have? How consciously is it fostered and nurtured? How often do you confirm and validate it? 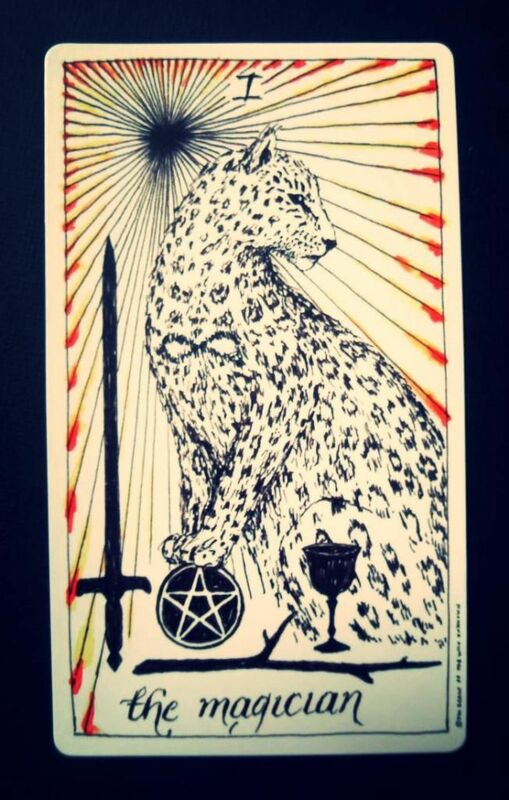 Often, this card points to a time of heightened abilities in manifesting and making things happen. It reminds you that you are the master of your life and that you hold the keys to the doors you wish to open. It's a masterclass in co-creation and the deeper you go, the more you learn about your innermost power to change things. Spiritual sovereignty is a big deal; when you know that your spiritual practice is an autonomous zone, you are ready to launch into nurturing explorations and discover what you're truly capable of. If you're tied down to old ideas and tired paradigms, The Magician is your permission slip for change. When you're ready for evolutionary downloads and fresh insights, you'll often find that you begin to shed your outdated perspectives. It can feel awkward and uncomfortable at first and you may experience resistance. But the chrysalis wants to break open and so the cosmos will often lead the way, directing you towards important messages and offering portals towards wisdom. You will often notice that you feel an etheric nudge in the back - go forward, open your eyes, embrace the new.. Once you are open to receive, you are divinely guided. (When the student is ready, the teacher will appear..) Whether you think that this guidance comes from the deeper levels of consciousness or from spirit guides and deities, the impact is the same and it's always undeniable. When it comes to manifestation, remember to begin with gratitude for the now. This switches up your energetic frequency so that you are mirroring the abundance you want to receive. Recognising all that there is to be grateful for also helps you to prioritise your desires. You will be able to see, through the majesty of 'feeling rich', that you can direct your energy to the most appropriate place and manifest something truly useful and meaningful. Sometimes we convince ourselves that we need a new material possession or a change of address, but when we take a look at the abundance which already exists in our lives, we realise that we were missing the mark - something inherently deeper is necessary before the tangible stuff can find its way through the net.. A perspective shift could be on the cards. Or maybe a little de-cluttering on the relationship front. Working out what's necessary is a big part of the dance. The answers aren't always where you thought they were, so it's really about paying attention and recognising what you do have to work with right now. The Magician reminds you that putting your desires out into the universe and commanding results is really about fostering belief in your ability to do that. Remember, the results might not come in the exact form you expected, but if you're taking inspired action in the tangible realm and showing up for yourself consistently, the outcome is sure to be magical. You will experience some surprises in your manifestation work - that's the way of it. It's a chance to learn and evolve. It's a chance to recognise that you are a part of this big ol' cosmos and that everything is connected by strange and subtle threads which shine and catch the rain.. Realisation is yours for the taking. Engage with it. Take notes. Personal power is super significant. The Magician can symbolise the need to address your level of access to personal power in different situations and relationships. If you feel unable to speak your truth or do what you really want to do, you are experiencing a disconnection from your sense of personal power and it's time to act in your own interests. If you find yourself people-pleasing, saying 'yes' when your heart says 'NO' or consistently compromising your dreams, The Magician reminds you of your self-imposed limitations and tells you that it's time to stop sidetracking your own needs. Get clear on your key motivations for accessing your personal power. It goes something like this..
Understanding how much your life is improved by wielding your power is the key to living a more inspired and wondrous life. Take a look at what happens when you try to deny your inner Magician. You'll find that suppressing this precious archetype leads to all kinds of trouble. When the inner Magician is permitted to cast spells, potent results follow.